Happy Friday to everyone! 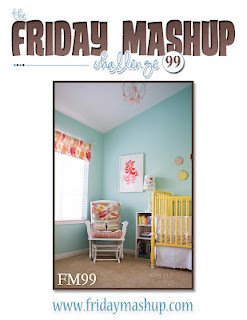 I hope you're ready for the weekend, and what better way to start it then to play along with us at The Friday Mashup! Liliana has a great mashup for us this week. She wants us to make a project for a baby/baby shower and to also use the colors So Saffron, Pool Party, Real Red and a neutral of your choice. Baby cards are always so hard for me, I dont know why. Maybe its because I havent been around babies in a while and dont have any baby mojo LOL I tried my best though and honestly, who can go wrong using this adorable elephant from Henry Says. 1. Make a project for a "Baby Shower or a Baby". 2. Or Make a project using the Colors "Pool Party, Real Red, So Saffron & a Neutral". 3. Or "Mash it Up" and create a project for a "Baby/Shower using the Colors listed above". Lisa, what an adorable card! 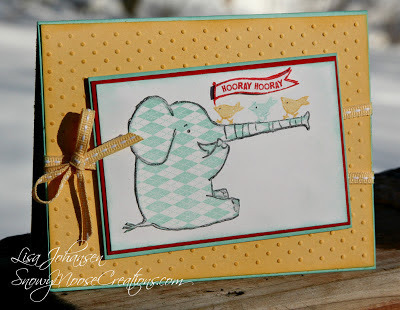 I just love the row of birds marching along the trunk of the elephant with a banner in tow. Adorable elephant! Such a cute creation! Thanks for sharing!